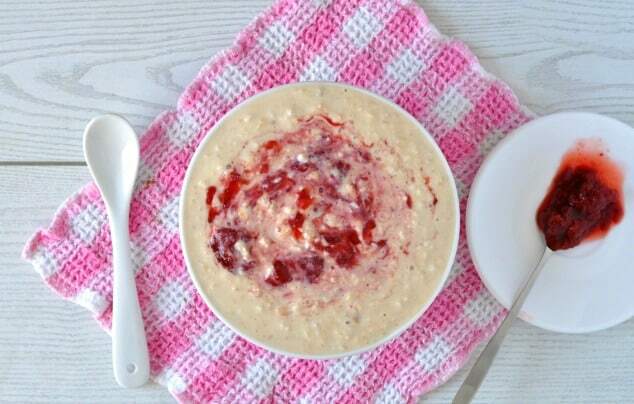 A healthy, balanced alternative to the classic childhood sandwich, these peanut butter overnight oats with jam will bring back all kinds of wonderful memories! 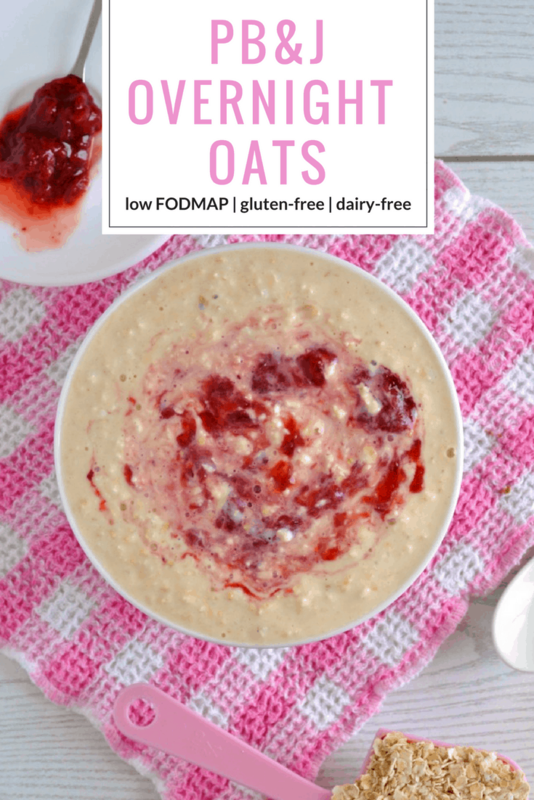 Gluten-free, dairy-free and low FODMAP, these healthy overnight oats make a great breakfast for absolutely anyone and only take 5 minutes to throw together. So you can can even make them on busy school nights for a quick and simple breakfast ready and waiting for you in the morning. It’s finally September! Which means we can forget about beach days, flamingo floaties and ridiculous temperatures of 100F+ and start thinking about crunchy fall leaves, pumpkin spice lattes and fun back-to-school recipes like this one. At least us grown-ups can. I’m pretty sure kids don’t get nearly as excited about back-to-school recipes as we do. But we’ve done the school thing, so we’ve earned it, right? 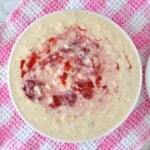 These peanut butter overnight oats with jam are my latest breakfast obsession. Although they might sound a little naughty (spoonfuls of fat-loaded peanut butter and sugar-laden jam can’t be good for you, right?!) I switched out the bad stuff for healthy alternatives. PB2 replaces the ordinary peanut butter and contains just 23 calories per tablespoon instead of 94! And for a healthy twist on the jam, I suggest you use my recipe for strawberry chia seed jam. It’s much easier to make than traditional strawberry jam, requires just 3 ingredients and is loaded with fibre, thanks to the chia seeds. If you need this to be a low FODMAP breakfast recipe, swap out the honey in the jam for an equal amount of maple syrup or ordinary sugar. What would you say if I told you I’ve never, ever had a PB&J sandwich? It’s true! Up until I was 18 and moved in with my boyfriend, I’d never even had peanut butter at all! We never had it at home when I was growing up and I guess I just thought it was some weird thing only Americans ate. Turns out it’s something delicious that everyone eats. And I missed out on its peanut buttery goodness for a full 18 years! Why haven’t I ever had a PB&J sandwich? The flavours just don’t appeal to me. Mix them together so you’ve got peanut butter overnight oats with jam and I’ll devour it and lick the bowl clean. But stick the flavours between 2 slices of bread and I’ll be looking in the fridge to see what else there is to eat. Weird, right? Now peanut butter and Nutella sandwiches – I’ve had plenty of those! And I combine peanut butter and chocolate together in recipes all the time. Hello chocolate peanut butter cup overnight oats! But I think this overnight oats recipe is the first time I’ve ever actually mixed peanut butter and jam together and couldn’t get enough of it. Maybe it will be the start of a beautiful friendship! A healthy low FODMAP breakfast recipe that tastes just like the classic children's sandwich! Gluten-free and dairy-free, these overnight oats are perfect for everyone who needs a quick nutritional breakfast that's ready when they are. Stir the oats, sugar, PB2, milk and yogurt together in a small bowl. Scoop into a jar or a container and leave in the fridge for at least 4 hours to thicken and chill. 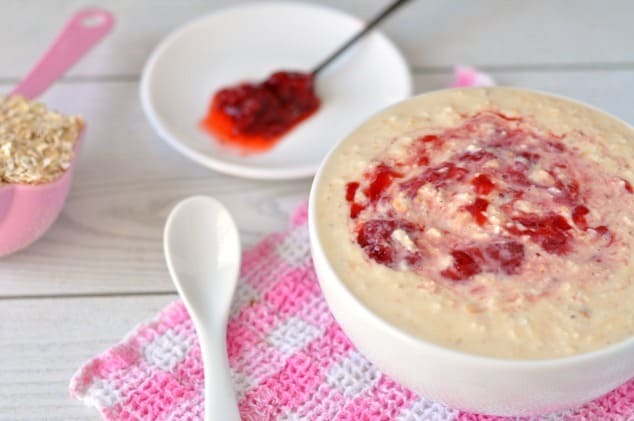 When you're ready to eat, scoop the oats into a bowl and swirl in the strawberry jam. I just love this idea, what a great way to send kids off to school happy and well fueled…but now I need to go check out that chocolate pb cup overnight oats ~ yikes! Thanks so much, Sue! I don’t have little ones, but I bet kids would love this, too! You so need to jump on the overnight oats train! Although I’m sure the minute you do, something else new will come along that you’ve absolutely got to try. That’s how in works in the foodie scene, right?! Love this combo and making it the day before ensures the whole family gets the BEST and most delicious breakfast! Heading over now to check out your Strawberry Chia Seed Jam – that sounds super yummy too! Many years ago, these overnight oats became a “thing” in the blogosphere and to be honest; I was excited to try them out. It’s been a while I tried them since, and if circumstances permit, I prefer using steel-cut oats. Can you believe I’ve never made overnight oats with steel cut oats?! I made steel cut oats ONCE in the slow cooker and…just…no. I don’t know what I did wrong but the smell and the texture were terrible. I tried a different recipe and pretty much the same thing happened. I’m sure it was me doing something wrong, but it put me off for life!